Although this is a very trying time for many, the key to getting through to the other side is to focus your efforts on not taking his changes personally. Use this time to give him space, unconditional love, and mostly, to focus on yourself. It’s important to know that this is only a temporary phase your husband is going through, and to retain the faith that you will make it through to the other side. Now for the wrap-up of this blog posting where I distill the essence into a witty quip, an aphorism, or a little joke. But how do you explain the unexplainable? 42? (see below, inside joke) Then again, it may be nothing more profound than It seemed like a good idea at the time. Midlife crisis is a term coined in 1965 by Elliott Jaques and used in Western societies to describe a period of dramatic self-doubt that is felt by some individuals in the “middle years” or middle age of life, as a result of sensing the passing of their own youth and the imminence of their old age. 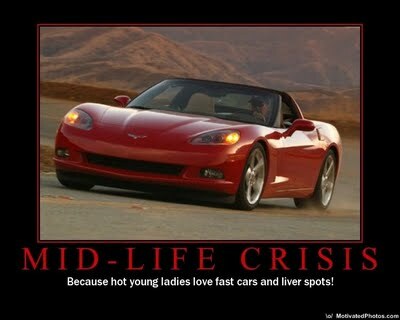 … Academic research since the 1980s rejects the notion of midlife crisis as a phase that most adults go through. In one study, fewer than 10% of people in the United States had psychological crises due to their age or aging. Personality type and a history of psychological crisis are believed to predispose some people to this “traditional” midlife crisis. People going through this suffer a variety of symptoms and exhibit a disparate range of behaviors. The meaning of life constitutes a philosophical question concerning the purpose and significance of life or existence in general. This concept can be expressed through a variety of related questions, such as “Why are we here?”, “What is life all about?”, and “What is the meaning of it all?” It has been the subject of much philosophical, scientific, and theological speculation throughout history. There have been a large number of theories to these questions from many different cultural and ideological backgrounds.